This week, we're combining two dishes that have previously appeared on our menu as separate entrees. 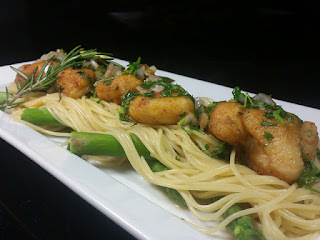 In the past, you've seen the likes of sauteed grouper cheeks over angel hair pasta. We've also had pan-fried skate wing with a lemon parsley butter. They both sold extremely well, so we thought, "Why not combine them for one great dish?" We begin with the cheeks from our fresh skate wing fish and saute them in a white wine and lemon-parsley butter. We then place them over a generous portion of angel hair pasta. The dish is topped and finished with the sauteed wine and butter blend.